Strap drop: 6″ – 8″. 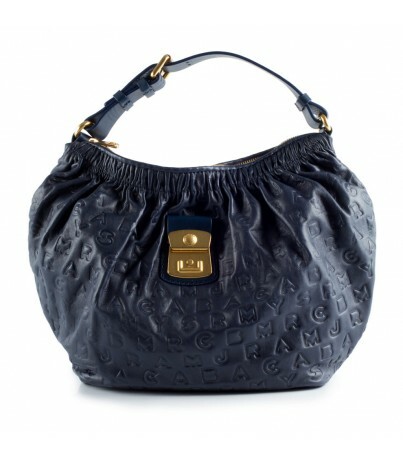 This is my MBMJ Dreamy Logo Lil Elettra bag in navy. I purchased this bag last November and started to wear it sometime in December. I love the leather, its feels very durable yet soft. The lettering on the outside isn’t overwhelming/flashy, someone will have to look very hard to see the wording. The lining is true to the MBMJ style – blue, yellow, cream and red colors with an inner zipper pocket and two side pockets to hold your cell phone & keys. The outside zipper, though tough at times, is very durable and sturdy. Overall size is cute; its round with a flat bottom which helps it sit straight. 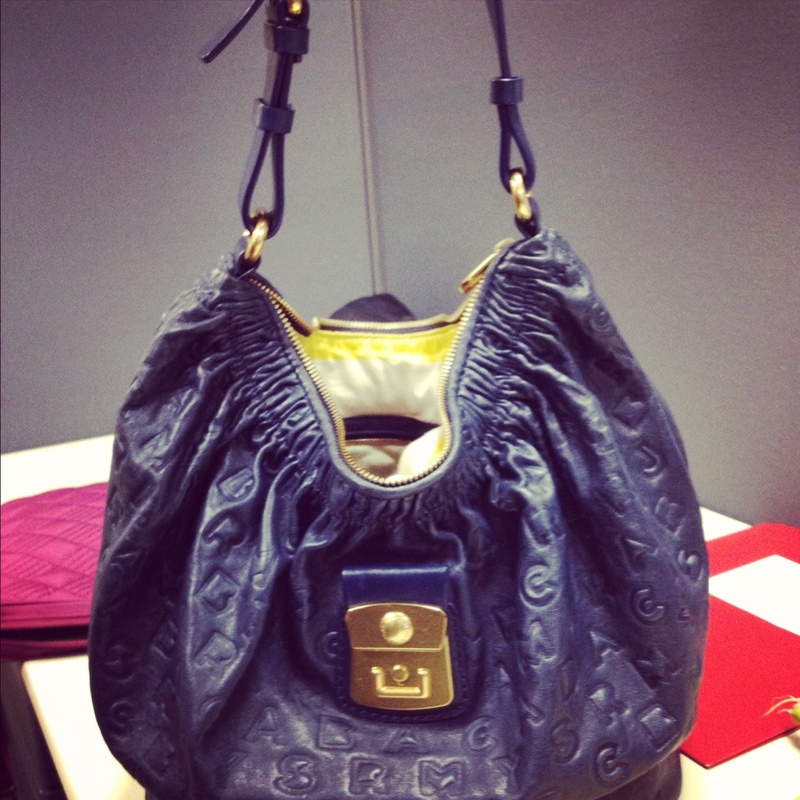 Now, though I love this bag to pieces…it’s a little troublesome for everyday use. For example, I have a travel wallet which holds my checkbook so its pretty long, well every time I try to stuff my wallet in the purse it gets caught on the two side pockets! GRRR!! That is so annoying! The mouth of the bag isn’t large enough for me. Another annoyance is I cant find anything in this bag. This is true with 98% of my handbags but this is just worst for some reason. Because the mouth of this bag is a bit small searching for my items are just a chore! Lastly, the strap is a bit short. Sure you can adjust it a little bit; I just would not recommend using this bag during the winter if you have a puffer coat on. It wont stay put, I constantly have to slide it back up my arm when walking. With less layers on the shoulder during warms months I’m sure it will stay put :). I’m going to switch this bag for trusty leather coach bag untill the warm weather rolls around. I think I’ll love it more than when it’s not sliding down my arm. Overall, it’s a great investment, it has a timeless look and the leather will last for years to come (if you take care of it of course). Unfortunately, its sold out in stored but you can always find it on eBay!